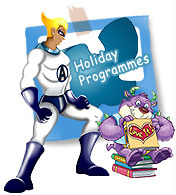 Our Holiday Programmes enhance learners' love of English through engaging games and activities. Our short courses are theme-based and child-centred. Our fully integrated preschool English programme. During the regular school term breaks and holidays, Hess Education Centre offers fun-filled, educational theme based Holiday Programmes. We offer English programmes for students from Nursery to Primary 6. Students' language skills are reinforced and developed through dynamic and interactive language teaching that makes use of our professionally designed materials and teaching aids. During the Holiday Programmes students will learn new vocabulary and sentence patterns that are relevant to the theme in a pressure free and stimulating environment. In addition to the vocabulary and grammar, students engage in arts and crafts projects, interactive language based songs, captivating stories, activities and language reinforcing games. The aim of these programmes is to take students on an educational journey that builds language skills and competency in a fun, engaging and stimulating environment.